Welcome to Week Three of the SciFund-LSU Instagram for Scientists class! This is the last week of the Instagram course. But don’t worry, there will still be plenty of ways to continue to engage with the class even beyond this week. First, keep using #lsuscifund , and continue following your classmates. Second, the Google+ classroom will remain available for all eternity or when Google decides to shut it down, whichever comes first (our bet is on eternity). This week we’re going to walk you through how to think about using Instagram for science beyond the class. Your goal will be to create a plan to build an audience and continue engagement for as long as you possibly can. Then as a bonus, we’ll show you a couple extra ways that you can expand your Insta-bilities through Stories and video. So let’s cut the jibber-jabber and get right into it! After playing with Instagram for the past two weeks, you probably have some ideas for how you would like to use Instagram going forward. But sometimes, it is easy to get stuck in a rut. After all, every artist (said with a fancy accent) is susceptible to a creative block. That’s why it becomes important to find inspiration. In Week One, we shared the following slideshow to illustrate how scientists are using Instagram. Now that you’ve gained some experience on Instagram, review these examples and use them as inspiration. Revisit these as you read through the approaches below and begin to plan your Instagram path for the future. 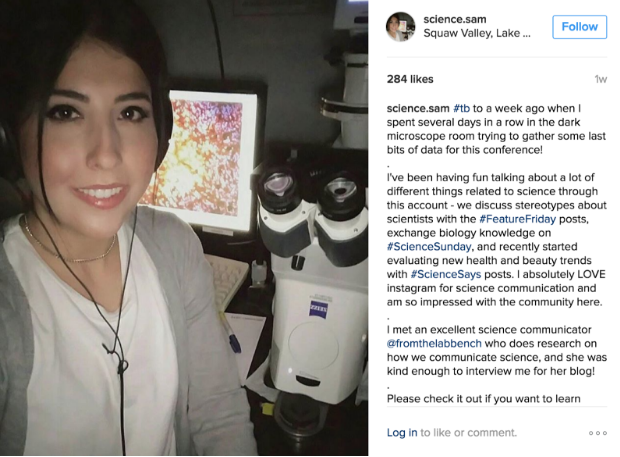 Instagram offers scientists and science communicators a unique opportunity to share their work and promote science learning among broader audiences. For example, Instagram-ers often create videos of chemistry experiments, tagged with various #chemistry related hashtags, to teach and demonstrate chemical reactions that many people typically don’t have access to. To further promote public engagement with science, Instagram users who post science-related content can invite people to “ come on a journey ” with them in the discovery of science in the lab or field. The selfie or the personal live broadcast is particularly well-suited to this, because viewers feel that they are there with you , having a conversation with you, and it transports them into a world of science they might never otherwise experience. Scientists on Instagram can also invite viewers to participate in creating scientific knowledge. For example, researchers at Louisiana State University started an Instagram account for their citizen science project Fox Finders . Through their Instagram feed , they encourage Louisiana residents to post pictures/videos of red foxes sighted in local areas in order to build a map of where red foxes live in Baton Rouge (see below for one of their cute fox posts). To promote public understanding of science, we encourage you to not only post information about the results of your scientific work on Instagram, but images/photos of science-in-the-making . Audiences increasingly expect to be “brought along on the journey of scientific discovery” as opposed to simply being educated about the final products of science. Try to post pictures of what science looks like for you on a daily basis. You can post visuals of methodologies, equipment you use in the lab, diagrams of research ideas you have, or even talk about the struggle of failed experiments on Instagram. If you are an undergraduate student, you can post visuals from your science lab courses and reflect on what you are learning. You can even post visuals of what it looks like to be YOU, as a scientist, on a daily basis – selfies from the field, selfies conducting data analysis , selfies from scientific conferences, selfies during late-night study sessions, etc. @science.sam does an excellent job of sharing her daily science life via posts and stories (more on that later). With Instagram, you have the ability to control your public perception. Recently there has been a movement among communities of scientists and science students online to create visual portrayals of scientists that counter stereotypes and to offer audiences a view inside their lives as scientists. The science “selfie” can actually help to make scientists and students of science more relatable to people outside of the scientific community. Invite people into your day-to-day life through instagram. This can help more people see themselves as potential scientists. Check out the very popular hashtag #sciart on Instagram and you will be open to a world of wonder. You too can join the #sciart party! You just need to get creative about how your science, your scientific research, or what you study as a science student could be visualized . Here’s just one example of the great visuals you find on #sciart. Do you work with living organisms in the lab or field? You could create videos of them to share with others on Instagram. ( Note: It’s best to share these in a positive way, as opposed to highlighting research done on animals such as mice that some non-scientists might find issues with. ) Do you work with colorful solutions or other visually interesting materials you could photograph? For example, here’s a geologist showing some neat up-close photographs of sand. Do you have access to a microscope you could use to share photos of your science on a micro-level, or telescope images to share your astronomy research? ( Note: All NASA images are public domain, and you can share these with credit on your Instagram account ). Can you create illustrations (see below), diagrams or figures that you could share on Instagram to represent your scientific research or what you are learning in your science classes? Do you conduct any interesting scientific processes, procedures or experiments that might be interesting to video, timelapse video, etc.? Even if you don’t have visuals you’ve created yourself of your science, scientists can now easily collaborate with artists to transform their science into visuals that broader audiences will engage with. Collaborate with local artists, your friends in the art department at your university, or reach out to artists online to explore working with them to visualize your science. In this section, we will help you develop your own social media plan for Instagram. We’ve provided a template below for you to fill out in order to create a plan for your Instagram, as well as suggestions for how you might fill in this template. You last assignment for this online course is to spend time filling in this template to bring your new science Instagram strategies to life! Every good social media plan starts with a mission statement or your primary goals. Physically write down your science communication goals. Focus on 1-3 broad goals. What are you really trying to achieve in sharing your science, and how are you trying to go about achieving those goals through Instagram? Grow a collaborative community of researchers in my field (e.g. biology, chemistry, invertebrate zoology, etc.) I can interact with. Build my professional network in my career area. Post interesting science visuals to start conversations with and “wow” my friends. Drive traffic to my science blog / online portfolio or resume. Translate my research findings for use by practitioners (such as conservationists or science policy makers). Increase awareness about the importance of my scientific work (such as measuring and preserving biodiversity). Help other see how cool my field of science is! Get students interested in my field of study. Communicate the significance of my research to potential funders, to ultimately enhance funds available for research in my field of science. Support other people like me studying/researching science, by acknowledging my own struggles as a ____ in science (a woman, a graduate student, a working parent, a first generation college student, etc.) and helping others to see that they aren’t alone. Express my love for science. Find personal enjoyment in interacting with people studying/researching in a broad range of scientific fields. You can write down literally ANY goals that seem right for you when it comes to sharing your science or scientific experiences on Instagram. The important thing is that you HAVE concrete goals. Otherwise, you might lose sight of why you are trying to communicate science or your life as a scientist on Instagram in the first place, which might lead to you feeling that there isn’t any point to it. Thinking about your goals, write down 1-3 key audience(s) for your science Instagram account. And be specific. Don’t just write down “people interested in science” or “public.” These terms are too broad to help you develop a useful plan. For example, if one of your goals is to get scientific researchers involved in science communication earlier in their science careers, in order to help them create research products that have greater impact and to expand their career options, then one of your key audiences might be undergraduate students studying science. When thinking about how you will achieve Instagram success, you definitely don’t want a challenging experience right off the bat. So instead, think about what you have available and how you can leverage that to build momentum and achieve your goals. What is your connection to your audience? You might be in the same geographical area, share similar interests, or share a common experience. This connection will always allow you to bring a unique perspective when posting to Instagram. What do you like to do? You might like photography, writing, drawing, or you are a great public speaker. All of these hobbies are actually skills that you’ve acquired and can use to achieve your communication goals. What kinds of experiences do you have? Think about everything that you have exclusive access to. You might be in a field of science where you regularly get to go to exclusive locations. Or perhaps you get to work with some really technical equipment. Sometimes you can find yourself in a scenario where you don’t think you can contribute anything that is visually interesting. Always be thinking about what your available resources are, because this can really help you determine creative solutions to an Instagram block. What happens if you are just working on your computer and you don’t have anything obviously visually interesting? Well, do you have some time on your hands? If so, think about what you are working on and if you can make it interesting. In general, you have access to your work daily, so it is very easy to feel like what you see and do isn’t interesting. But most of your audience does not have the same level of access. To them your work is exclusive, and everyone appreciates exclusive access. Spend a little time on the problem at hand, and you’ll come up with a creative solution. For example, Anthony dealt with alginate all the time. To him, that was boring. 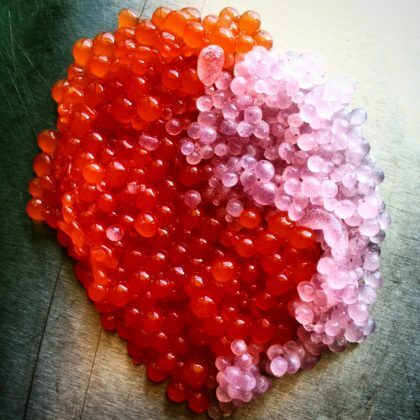 But one day he got the idea to add food coloring to his alginate spheres and took the picture above. A bit of resource analysis allowed him to share his daily experience in a new and engaging way. Keeping in mind what your goals are and who your audience is, it is time to figure out how you are going to achieve your goals. That is, the actual steps you are going to take each day to engage your audience. These objectives should be specific , realistic and measurable . Frequency of posts: Identify how frequently you want to post content. Create a calendar and identify the type of content you will share and how often you will do that. Maybe you decide to post two pictures each week, one hand drawn and the other of something funny in the lab. Then you decide to share one video a week of you working in the field. The key is to be specific, and to create a plan that is achievable. Content Types: Instagram allows you to share photos and videos and to do so permanently (normal posts), temporarily (Stories), or live. Figure out which methods you’d like to use and when you’d like to do it. We’ll be talking about Stories later in these materials. Hashtags I Will Use: Identify specific hashtags that you might use regularly, associated with your field of science, your goals, your key audiences, etc. Hashtags not connected with your science often draw in the most people. For example, including a hashtag indicating your city/state/other location can draw in a wide audience. Additionally, you can create your own hashtags to curate content or even raise awareness that others can use as well. People I Will Follow: Identify the types of Instagram users you will try to follow over time. This is important because people tend to follow you back once you follow them. By following people who share your interests/goals, or by following people who represent your target audience(s), you can grow a community of fellow Instagram users who will be more engaged with your content. How I Will Determine Success: Come up with ideas for how you will measure or determine your success on Instagram, or the progress you are making in achieving your science communication goals through content on this platform. This should NOT simply be number of followers – a small number of followers who are engaged with your content and represent your target audiences is much better than a large number of followers who don’t engage or aren’t the type of people you are really trying to reach. Your action plan should fit with your overarching science communication goals and the objectives you’ve set for what you want to achieve in sharing your science via Instagram. You can always post other things that come up as spontaneous inspiration to you, but it’s always good to have planned content so that you aren’t searching in the dark for something to post this week. We leave you with one final assignment in this class, and that is to produce content! Over the next few months, follow the science social media plan you developed and create content that is interesting and meaningful to you. At first, challenge yourself to create content on a regular basis (e.g. once a week) in order to get into the habit of “seeing” Instagram opportunities in your daily live as a science student, scientist, science communicator, science artist, etc. It is ok if your strategies and your goals change over time. The key is to sustain your ability to communicate your science. 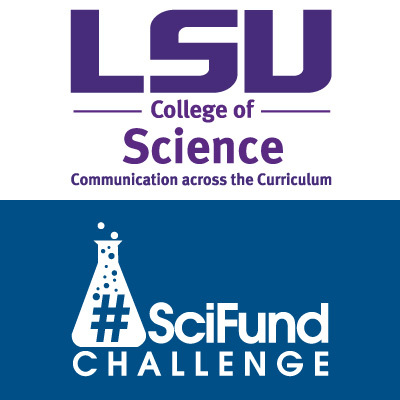 Be sure to share your content with us by continuing to use the hashtag #LSUSciFund. We are excited to see your science Instagram accounts grow! How will you achieve these goals? What is your action plan? Now that you’ve come up with a plan, post your first picture within that context. Then keep the momentum going! Bonus Assignment: Create 2 stories (see Bonus Materials for details on how). Bonus Assignment: Share a video to your feed (see Bonus Materials for details on how). Bonus Assignment: Repost someone’s content (see Bonus Materials for details on how). Click Here for Instagram Class BONUS Materials!